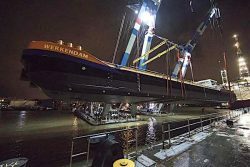 The Werkendam, Van Oord’s new crane vessel, has been successfully launched in the Waalhaven in Rotterdam, the Netherlands. This is the first Liquefied Natural Gas (LNG)-powered vessel in the Van Oord fleet. Earlier in January, Pieter van Oord was named ‘Port Man of the Year 2017’ by the Port of Rotterdam. The delivery of the vessel and its christening are scheduled for April 2018. It will generally be deployed to Netherlands-based projects executed by subsidiary Paans Van Oord. Pieter van Oord was named ‘Port Man of the Year 2017’ (Havenman van het Jaar 2017) at the annual ceremony on 8 January. This title has been awarded since 1981 and is given for outstanding contributions towards the development of the Port of Rotterdam. As the 37th Port Man of the Year, I’m proud to be the new ambassador of the port of Rotterdam. As a global marine contractor, we have a lot in common with Rotterdam: always looking for new technological challenges, an international standing and an ‘actions speak louder than words’ mentality.